When I was first handed this book, I didn’t know what I was in for. The book is wrapped in a black and white picture of a well-dressed hispanic man with his palms pushed together in a position of prayer. I told the friend who gave me the book that it looked like it was for readers with more religion than me. Before I dug into the book, I went online to watch videos of Pastor Sam Rodriguez to get a hint of what I was in for. Rodriguez is a preacher’s preacher; fiery and theatrical; engaging and engrossing. He has a way with language and can turn a phrase; he’s eloquent and passionate. Rodriguez get's my attention from the very beginning of Be Light with the line "Let there be light!" That's where it all starts, right? The way Rodriguez defined "light" and explores the word from so many angles gave me something to chew on all day. So, mission accomplished, Sam! That’s right. 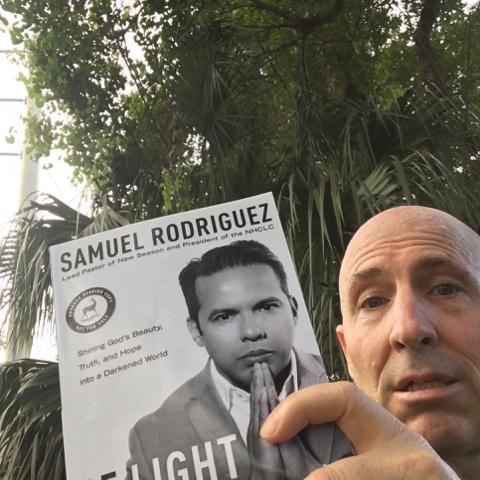 Rodriguez wrote the book and formatted it with a thirty day “journey” in mind for the reader. Each one of the Be Light’s thirty chapters are meant to be read in less than ten minutes each day for thrity days. Each chapter’s goal is to challenge the reader to be light. Chapter one starts with some powerful, quotable phrases that show that Rodriguez is more than a fiery preacher. He’s a thinker and wants those he communicates with to engage with him at a cerebral level always turning his phrases over in their minds. "Let there be light!" This is how Rodriguez opens his dialogue with readers. This is a powerful, biblical quote from Genesis One and echoes of the gospel of John. Rodriguez has the reader’s. It evokes layers of meaning that readers are forced to think about and personally apply. Rodriguez writes about a "canopy of disillusionment" which seems to be a familiar concept to many a cynical Christian. We've become used to disillusionment and let allowed our faith to hibernate, inneffective, impotent, fat, and lazy. This is unacceptable, according to Rodriguez. It's time to “throw off dissillusionment” because there's no purpose for it in God's economy. I love the way he ends the first chapter by contrasting biblical heroes with villains. We need more REAL heroes in our lives. In chapter two, Rodrigurez employs the scientific term "reflective coefficient." The biblical application here is that sometimes I reflect God's light, and other times, I absorb every bit of it. In chapter three, Rodriguez discusses the battle that rages between light and dark. Darkness wants to shut down light in the Christian’s life. Even Christians (especially Christians?) can live in the darkness that comes from unbelief and unforgiveness. This chapter caused me to take a personal inventory as I read through it. Am I withholding forgiveness from somebody? I think I am. Do I have what it takes to get the process of forgiving and reflecting light into the life of the person who has offended me? I hope I do. I pray that the Holy Spirit will give me courage to be humble. Those are all the spoilers I’m going to give you, friend. As thought provoking as it is, Be Light is an easy read. The time you invest in this book will be time well spent. As you come to the end of the Be Light journey, it’s Rodriguez’s goal that somehow, someway, God will use you to be one of the heroes that turn on the lights in the world God has placed you in. Get the book and read it with your tribe.